“No one is born with the mindset, disciplines, or skills necessary to be an effective preacher of the gospel of Jesus Christ. Preachers are not born; they must be made.” With these words, pastor, professor, and preacher extraordinaire, Marvin McMickle offers a five-stage approach to the spiritual formation of the preacher. Drawing from the biblical life of Moses, the formation process traces the preacher’s development through the steps of Call, Character, Content, Context, and Consequences. By exploring the process of spiritual formation on display in that leader’s life in Scripture, readers will be able to consider and deepen their own preaching ministries. 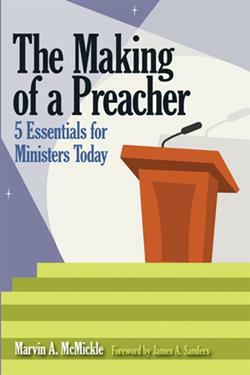 I am in awe of his last book, The Making of a Preacher: Essentials for Ministers Today. Dr. McMickle says no one is born with the mindset, the disciplines, or the skills necessary to be an effective preacher of the gospel of Jesus Christ. Preachers are not born but made. Nothing written today comes near this book in addressing what leaders need for gospel ministry. Academics do not usually write about the practical issues of character, but Dr. McMickle is no ivory-tower scholar. He blends orthodoxy and orthopraxy and as an academic he has extensive end notes and bibliography after each chapter.